In NoodleRice & Friends “Untitled Act II,” beautiful large bubbles float over the stage to create a mysteriously theatrical world, in which otherworldly characters play out a series of compelling and surreal scenarios. In this inventive performance and sculptural collaboration by artist/designer Yao Zhang and Liang Guo of NoodleRice & Friends, a collage of theatrical phrases depicts the character transformations in identity/gender/species. NoodleRice & Friends is a collective working at the intersection of film/video and live performance, first conceived as a film studio by Yao Zhang and Liang Guo in 2008 when they were both at the Beijing Film Academy. They expanded their work into performance art and theater during their MFA years at California Institute of the Arts. Powered by forward momentum, this practice-turned-performance for three dancers invites the multiplicity of the feminine to be visible in wildness and in formality, Rage and all. In Los Angeles, the stage becomes our safe space to walk to our hearts and bodies’ content, remembering the places our legs have taken us and our ancestors. Alexx Shilling is fully committed to the infinite investigation of movement and its potential to uncover alternative narratives and allow us to remember. 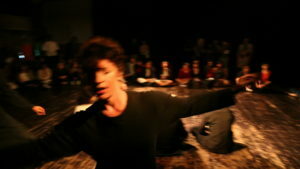 Her original choreography and experimental films have been presented nationally and internationally, through residencies at the Millay Colony and Ebenbökhaus / Jewish Museum in Munich, and with generous support from institutions including Dance Films Association, CCI, Lower Manhattan Cultural Council and CHIME both as Artistic Director of alexx makes dances and ann and alexx make dances (with Ann Robideaux). As a performer, she currently collaborates with Victoria Marks (since 2010), Richard Rivera/Physual (New York, Company Member 2003 – 2010) and Ros Warby. She received her M.F.A. in dance from UCLA’s Department of World Arts & Culture/Dance and an undergraduate degree in Dance from Skidmore College. She has taught at the American Dance Festival, UCLA, the Wooden Floor and at New York’s Peridance Center, among others. Currently, she is the Pilates Specialist at Loyola Marymount University’s Dance Department. Along with Devika Wickremesinghe, Shilling co-curates the series Hi, Solo. During her 11 years in New York, she founded and co-curated the popular BODY BLEND series at Dixon Place with Sara Juli, founded and directed RADIANT PILATES and the RADIANT MOVEMENT STUDIOS in New York City. She continues to work with long-time New York-based collaborators Janusz Jaworski, Ann Robideaux, and Mimi Yin. Maria Garcia‘s “Impart— Scenes of Abjection” is a series of absurd images and reflections of the demonization of the immigrant, female sexuality, and death. At an URGENT time of HOT war, and a global migration crisis many political bodies are showing their backs to the repugnant realities of execution, and blaming the ritual of crossing borders instead. The migrant is regularly demonized in daily political theatre. DNA tests requiring the drawing of blood are being floated as extreme vetting measures designed to deter the other, and rip the mother from her child. This has happened before and before. In 1968 the British Conservative Member of Parliament Enoch Powell delivered his infamous Rivers of Blood speech in which he declared Commonwealth immigration and anti-discrimination legislation madness: “Those whom the gods wish to destroy, they first make mad. We must be mad, literally mad, as a nation to be permitting the annual inflow of some 50,000 dependants, who are for the most part the material of the future growth of the immigrant-descended population. It is like watching a nation busily engaged in heaping up its own funeral pyre.” Powell’s demagogic display led to his dismissal from the shadow cabinet. MADNESS!!!!!! “Impart” is an ongoing investigation, presented by a former Miss USA contestant called MedUSA, a Cardinal, a Nun, a Plague Doctor and their dancing, 80’s electric guitar playing, film(ing), and other slapstick idiocy(ing). Native to Southern California, Samantha Mohr holds a BA in World Arts and Cultures/Dance from the University of California, Los Angeles. She has since collaborated as a performer with Lionel Popkin, David Roussève, Victoria Marks, Julien Prévieux, Elizabeth Leister, Rebecca Bruno, Laurel Jenkins, Alexx Shilling, and Monica Duncan. Samantha has performed and presented shared works through homeLA/Frogtown in partnership with The Women’s Center for Creative Work, at the Los Angeles Municipal Art Gallery, LACE Gallery, the Hammer Museum, and Highways Performance Space. In addition to dancing, she is currently pursuing her 200 hour registered yoga teacher certification with Farzaneh Noori, Hanna Gilan and Allison Linamen.